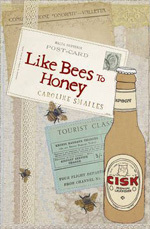 In her latest novel Like Bees to Honey Caroline Smailes weaves a beautiful story of redemption and renews our way of seeing the world as she does so. The storyline follows Nina, a burdened and troubled woman, as she travels from her adopted home in Liverpool to her native hometown in Malta. Up until this point in her story she has lived a life caught between different realms of existence and love. However, Nina now seeks to heal and rein in the jarring fragments of herself while learning to let go of her secretive and unbound grief. Nina's return to her roots, where family and cultural lore provide a solid foundation to her present fragile identity, marks the beginning of a tumultuous and solitary trip peppered with real life ghosts! Throughout her life Nina has had to learn to balance love through absence, loss and guilt. She was disowned by her conservative Maltese parents when she became pregnant out of wedlock. The reader witnesses Nina's poignant and tender cross cultural love story with her husband Matt through a series of unsent letters scattered throughout the novel. However, it is the theme of maternal love that Smailes confronts and explores with the most courage and brutal honesty. She fearlessly portrays all the complexities of motherhood; including the jagged, cutting edges of guilt and regret. In Like Bees to Honey Smailes has made an enormous shift from the rich dark realism of her previous novels to sparkly vibrant magic realism. In Dickensian manner, spirits from the past, present and future interact and tell Nina their stories, which in turn reflect off and embellish aspects of Nina's own tale. The supernatural thrust in the storyline lightens the mood of the novel without detracting from the sobriety of its themes or the depth of Nina's self discovery. The idea of stories as medicine for the soul, or stories as healing herbs—such as the herbs Nina's own mother used to cure and prevent illnesses—adds to the magical essence of this novel, and indeed to all fiction. Smailes has worked into the story some amazing and intriguing characters. Nina's mentor in her spiritual and physical journey is a very cool, albeit eccentric Jesus. Jesus has a penchant for Cisk (Maltese) beer, colourful toenail varnish, reality TV and Cadbury's chocolate. He hangs out at the phantasmal 'Larry's Bar' and Nina has a number of interesting and extremely informative direct and indirect encounters with him. The fantastic whirling Tilly is a spirit whose anger at the whole world is so potent that she is unable to stay still or touch the ground. She hovers on the roof, out of touch with reality and truth; a little like how she lived her life. Like Nina, she needs to learn to forgive and find peace with herself in order to move onto the next stage in life/death. Smailes has a background in linguistics, and you can tell when you approach her fiction. Like Bees to Honey focuses on language and translation; the translation of experience into words as a form of therapy, as well as the translation of culture. The novel is carefully littered with scraps of information from tourist guidebooks (about Malta) regarding history, monuments, and buildings. It also informs through miscellaneous paraphernalia such as bumper stickers, Maltese recipes and dictionary definitions. Like Bees to Honey is also about the actual translation of words, too—there is a constant ping pong of emotion that seeps from word to word as languages are switched, flipped, repeated and intertwined. Maltese words bleed into the English translation and become one: layered, poetic and shimmering with the sense of place. Smailes deftly manipulates and interweaves the meaning of words using their physical shape, form and the way they can be divided. The white spaces on the pages of her novels cling to words, dragging out meaning, sound and sensation, while simultaneously accompanying and informing their sense. This visual (and extremely sensual) effect of her writing breathes life into her elegant prose and adds a whole new dimension to reading. This is a novel packed with significance, and upon every reading the reader surfaces triumphantly with treasure as meanings broaden and take on deeper significance. In this novel Caroline Smailes has pushed at boundaries of literary fiction and language as her characters explore and break down their own multifarious confines in order to create that essential integral sense of identity that can only exist if we learn to really forgive ourselves the unforgiveable.